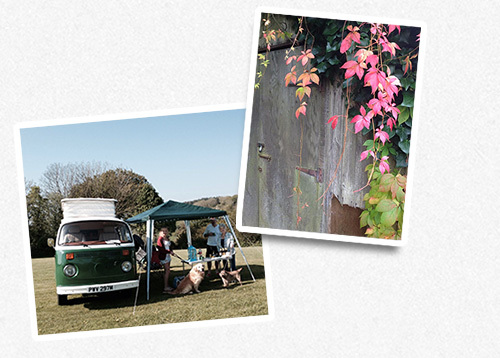 Accommodates – Touring Caravans, Motorhomes, Campervans, Tents, Trailer Tents and 10 letting Static Holiday homes. Hardstanding and grass pitches (some with gravel awning bases) with and without services are available set in two near level fields. All Static caravans have 3 or 4 steps to them. The main buildings are well lit, the rest of the park has low level lighting. CCTV in operation. 1 mile to Sidford – Nearest Pub (Blue Ball), Spar shop and Vet. Waitrose (nearest supermarket) half a mile past Sidford on A3052. 1.5 miles to Sidmouth – Seaside town, shops, beach, restaurants, cafes etc. Located just inside main gate (only gate for vehicles) on left. “ steps to door (ramp, low level bell available). Open 8.30 am to 5.30 pm daily (7 days). Basic provisions, camping supplies (inc. gas), Tourist information and local info available during normal hours. A warden is available 8.30 am to 5.30 pm, if shop is closed follow instructions on sign by the door. Latest check in time is 8.15 pm. Emergency availability after 8.30pm – Please use instructions on the sign at Reception door. Near level access by step or path. Has 2 x 2 rooms for both Ladies and Gents (2 shower cubicles in each have folding seats), washing up facilities, laundrette (coin operated washers, dryers, spinner and hand wash), small family bathroom (with grab rails over bath) for less abled or for those requiring privacy. Door not wide enough for wheelchair (Part M) access. Unisex rooms comprising 4 WC’s, 2 Shower Cubicles and one Family Shower room. All level and ramped access with Part M doorways. Room to manoeuvre wheelchair in Family Shower room only. Dogs to be kept on lead at all times and NOT left unattended at any time. A dog walk (allowed off lead), a sloping area and a flat area, is for your use – bags and bins are provided for you to clear up after your dog please. All dogs are permitted subject to our Dog Policy. Mobile phone signal varies around the park and depends on your network provider. A payphone is available at reception (outside) 24hours. Wi-Fi. Available from third party supplier (Club Wi-Fi) . Online payment system.